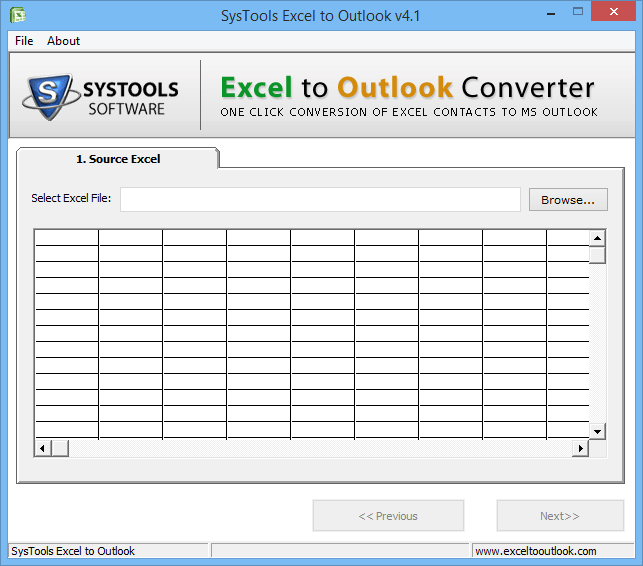 The Excel to Outlook Converter provides the simple but smart solution to export Excel contacts to Outlook. Many advance features are exhibited by this tool. The utility is compatible with all the versions of Windows as well as Outlook. Demo version of the software enables the user to convert only 5 contacts from MS Excel to Outlook. To export the entire list of contacts, user can go with licensed version of the tool. 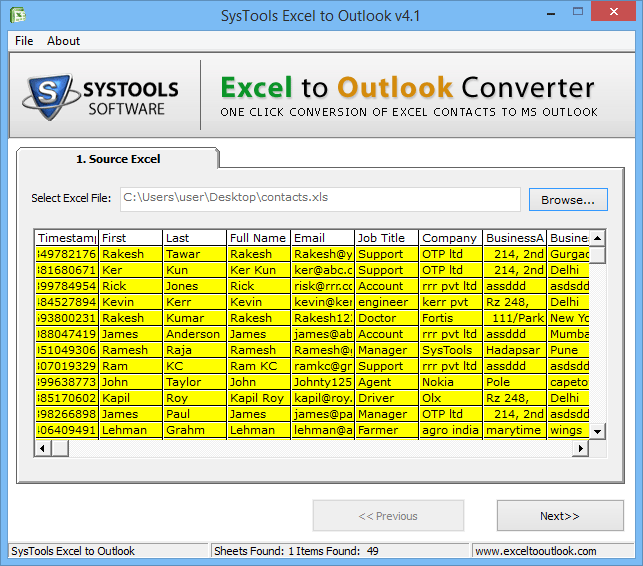 The tool move contacts from Excel to Outlook. All the necessary details like first name, last name, address, email address, contact number, etc are exported with XLS contacts from Excel to Outlook. It is also feasible to export contacts in CSV file format. 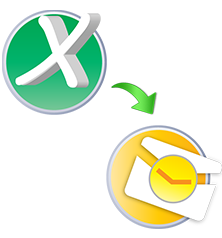 Excel to Outlook Converter migrates XLS contacts from Excel to Outlook and provide an option to save them directly here. Once the conversion is finished, all the imported contacts can be viewed along with the necessary details. When contacts are exported from Excel to Outlook, it is essential to map the fields properly. This is done with the help of mapping feature exhibited by Excel to Outlook converter. Using this feature, all the details can be saved in proper manner. Is this mandatory to install Outlook on my machine before using the tool? Yes, it is required to have Outlook installed on your system to use this tool. Can I import contacts from Excel to Outlook distribution list? 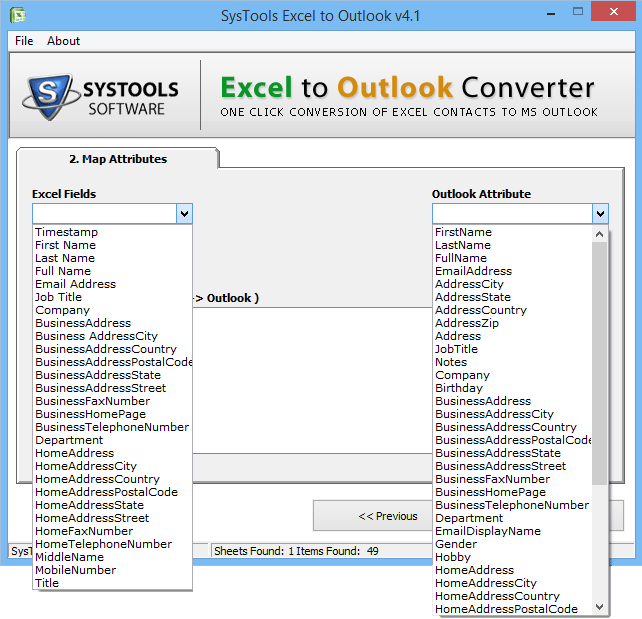 Yes, the tool permits the user to export Excel contacts into distribution list in Outlook. "I want to transfer my contacts from Excel to Outlook. After export. I also want to save them. Many software are available in market. They provide the feature to export but not to save contacts. Then, one day while talking to a friend, he recommended me about Excel to Outlook converter. I searched about it and read the features. All the feasible were perfect according to a user. Thank you." "Amazing tool!!! The developer of the tool deserves a great round of applause. It exports and save the details of the contacts in an organized way. Seriously, the working efficiency and speed of the tool is beyond my expectation. Even I am using older version of Outlook, still the software performs very well in here. The feature I like the most is it automatically removes duplicate contacts while exporting it in Outlook."